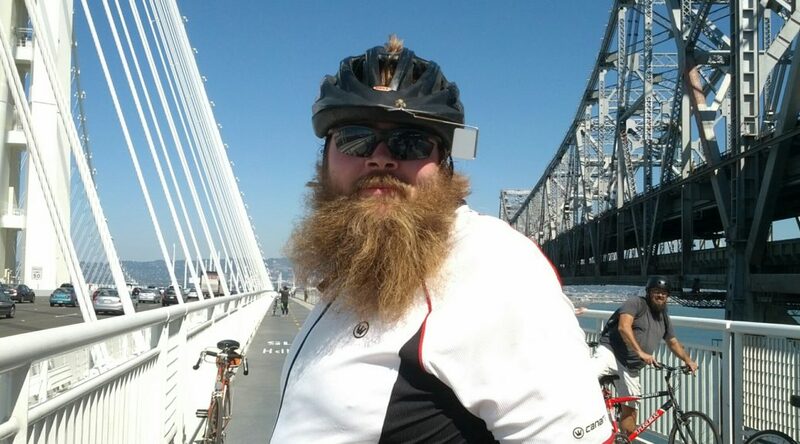 Since the new Bay Bridge has fancy new bike and pedestrian access, we figured we ought to check it out. It would be lame to drive up there just to do a six mile round trip on the bridge, so we decided to do the ride from home. The morning was actually kind of cold, foggy, and intermittently misting and drizzling. I was a bit concerned for a bit — would the fog ruin the view? Would it turn into full-blown rain, stranding us without rain gear? It cleared up and turned into a pretty nice day. We spent some time going along the Bay Trail in Hayward and San Leandro. It had some nice views of the bay, wetlands, inlets and birds. The trail surface varied from dirt to packed gravel to loose gravel, though, which made for a less than entirely pleasant ride. Riding past the Oakland airport was neat. The road was in good shape, and Ruth was excited about the airplanes landing from up close. Then we started to get into Alameda and Oakland itself and it got a bit more hectic. There was more traffic, and more complicated traffic patterns. Bikes were randomly forbidden from certain bridges, but without clear signage as to what we were supposed to do. We finally made it to the bridge itself. Turns out, we weren’t the only ones with this idea — it was crawling with people walking and biking. The path was wide enough, but people weren’t really staying in the marked lanes very well. Plus, people would randomly and without warning stop, or turn around, or shift from side to side. It made for a kind of treacherous ride. It was pretty cool, though, with the shiny new white bridge to the right of us, and the grungy old one to the left. The path doesn’t actually go anywhere yet. You can’t even get to Treasure Island until 2015, when they complete demolishing the old bridge. Who knows when you’ll be able to bike to San Francisco. Then we retraced our steps for the return, with a few tweaks. Going back through Oakland and Alameda was a lot nicer this time, since we sort of knew what we were doing. We found a real road as an alternate for the worst of the Bay Trail. Ruth was delightful all day. She resisted a little bit putting on the helmet after breaks, but in a playful way. She did pour out her water bottle into her snack cup, which ended up getting soaking her clothes.. but that’s why we bring spare clothes. She took a good nap in the afternoon, which meant she missed the Bay Bridge, but she enjoyed all the bumpy parts on the Bay Trail. It’s nice to do these long rides from home. It means that we can roll right into the garage and immediately wash off the sweat. No loading up the car, no sitting through a drive while covered in road grime. This ride was very flat and urban, though, which is definitely less nice than the rolling countryside.